We were team leaders this year of a group of boys competing in Destination Imagination, a global organization that gives teams of students the opportunity to compete in creative problem solving challenges. 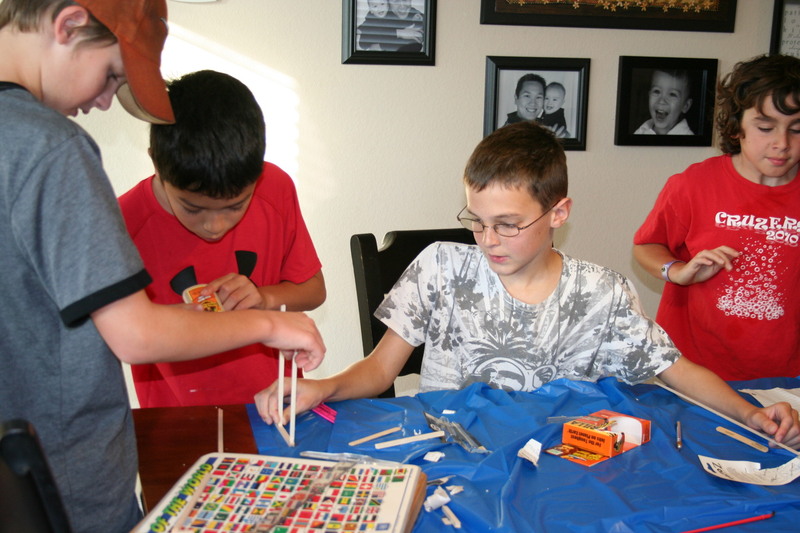 Our oldest son met weekly with a group of 3 other boys here at our home to practice instant challenges and work on their main focus project – building a tower out of only natural wood and glue that could hold as much weight as possible. In addition, it had to hold golf balls, delivered by their own constructed “delivery device” and tie in with a relevant creative story presentation – all performed in 8 minutes! It was a life changing experience for us all. The great catch was that there was absolutely NO adult “interference.” The team was responsible for making ALL decisions, without our suggestions or opinions. We could help them find research and coach them through some basic teamwork and problem solving skills, but they had to own the entire process and solution. And the beautiful thing about it was that the boys made it all happen. They did it! They built a structure that could hold 310 pounds of weights! It was only 8.5 inches tall made of balsa wood and super glue. They came up with all of their costumes, props, sign, and story line. They learned how to really personally identify and live into their strengths, celebrate and respect each other, and make decisions as a team. But they failed. Out of 14 teams competing, they came in 12th. Now, if you have more of “everyone’s a winner” mentality, you might rationalize their results, but the fact is that, in comparison to the other teams, as my son says when asked, “We sucked.” They lost. They were honest about it. The beautiful thing is that they owned it – they couldn’t dismiss or blame any part of the result on anyone else. It was theirs. Not like some science projects that kids and parents work on till the last minute, to the point where the parent should be the one receiving the medal, and they have a skewed sense of their achievement. Nope, this was all on their shoulders. And oh man, what an experience. They’re geared up and want to do it again. This being their first year, they now have perspective and a better idea of what they should really shoot for. Sure, they worked hard, but now they know the level of quality and hard work required to have a shot at a top place slot. As a mom and homeschool teacher, I learned a huge, important, necessary lesson, especially as I am transitioning into these older years with our son – give him space to decide and fail. I had to bite my tongue and leave the room before I tried to sneak in a little hint here or there. I saw it transfer into other aspects of our relationship. I learned to stop buffering his decisions in order to help him avoid those negative potential consequences. This allowed him to truly own the success . . . or failure. And we all know that as memorable as our successes are, we typically learn most – those lessons that really stick – from our failures. And especially when we can’t point the blame finger at someone else. They can propel us towards conviction and growth if allow them. “Keep moving forward,” they say in Disney’s Meet the Robinson’s. I was so, so grateful for this experience with Destination Imagination this year. The mature, respectful, fun new friendships that grew out of it with these 4 boys was a privilege to watch first hand. I watched them grow, confident about who they were in their own skin. I watched them experience many successes all along the way . . . and many failures, too. But we all learned from it all. Do you allow your child the space and freedom to own their decisions – and the consequences of them – without shaming them for it? Can you share some examples of what this looks like in your family or homeschooling?